For sexually reproducing organisms, the diploid life cycle starts with the fusion of a sperm cell with an egg cell. This process, known as fertilization, results in the formation of a zygote, the first diploid cell from which a multicellular embryo develops. In animals, embryo initiation has been shown to be under maternal control, driven by the gene products stored in the egg cytoplasm. For example, in the absence of zygotic transcription, Caenorhabditis elegans zygotes can progress to the 100 cell stage before arresting1. This raises an important question: if the maternal gene products are able to drive embryo development, why do egg cells depend on sperm cell fertilization for embryo initiation? Why is there a fertilization block in sexual organisms? This work was started in the Sundaresan lab at UC Davis to understand embryo initiation in rice, particularly the role of BABY BOOM (BBM) genes in it. BBM genes belong to AP2 family of transcription factors. Our previous study showed that the expression of three BBM genes is induced in zygotes after fertilization2. Among these, BBM1 was specifically expressed from the male allele (Fig. 1). Although this was an important observation, it needed further confirmation. We attempted confocal imaging of intact zygotes expressing BBM-GFP, but when BBM-GFP plants were used as either the male or the female parent, it did not work: rice carpels are thick and green, so the GFP signal was impossible to view through this tissue. Isolating zygotes is possible in rice and had been done by our team previously, but it is a tedious process which involves manual dissection. Isolating and imaging a statistically significant number of zygotes for our purpose would have probably taken us a year or more, so we decided to use antibodies against GFP to detect the BBM1-GFP expression in zygotes. However, this created another challenge- is immunohistochemistry sensitive enough to detect the expression in a single nucleus? It did work, and it worked well! Figure 1. Mechanism of embryo initiation in rice. BBM1, an AP-2 domain transcription factor is expressed in the sperm cell but not in the egg cell. After fertilization, its expression from the male genome activates the embryo initiation program in the zygote. Its expression in the later stages of embryo development is required for embryo organ formation. We could now confirm that BBM1 is expressed only from the male allele in zygotes, immediately after fertilization (Fig. 1). We also found that ectopic overexpression of BBM1 induces somatic embryogenesis in heterologous tissues like leaves. The latter observation, combined with male-specific expression of BBM1 in the early zygotes, lead us to hypothesize that BBM1 expression probably initiates embryogenesis after fertilization. To test this hypothesis, we drove the expression of BBM1 in egg cells using an Arabidopsis egg cell promoter3. At that time (back in 2014), we were not even sure if this promoter was going to work in rice. Egg cell expression of BBM1 resulted in embryo formation without the need for fertilization, a process known as parthenogenesis. Thus, it turns out that the sperm cell transmitted BBM1 initiates embryogenesis after fertilization (Fig.1). BBM-like genes were first discovered in Brassica microspore cultures4. Although, BBM-like genes from Arabidopsis and Brassica have been shown to induce somatic embryogenesis4, their role is zygotic embryogenesis is not known because their loss-of-function mutants do not show any embryonic phenotypes. The variety of rice that we use for our experiments, Kitaake, has one of the shortest generation times among different experimental varieties of rice (still about four months!). However, generating new transgenic lines from tissue culture can take up to 8 months. So, using rice for studying genetics can be a lengthy affair. However, we decided to take this long path and study the genetics of BBM genes in rice. The vectors for CRISPR-Cas9 gene editing were provided by Dr. Bing Yang from Iowa State University. We created a single knockout mutant of BBM1, but it did not show any phenotype (Fig. 2a). 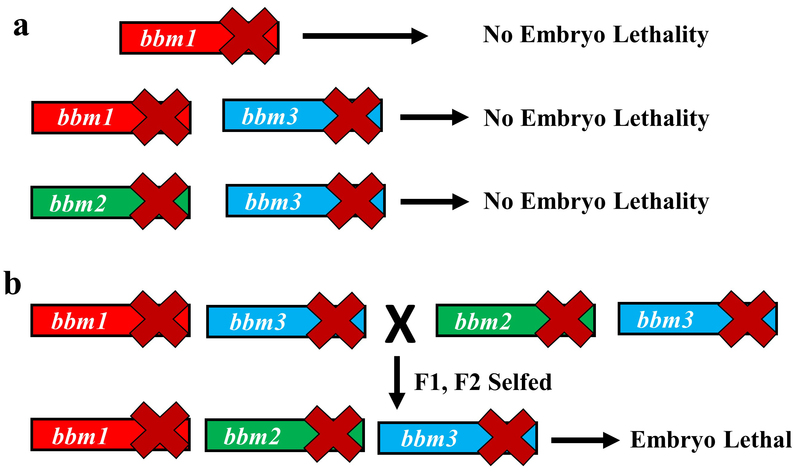 The double mutant of BBM1 and BBM3 (bbm1 bbm3) did not show any embryonic phenotype either (Fig 2a). An attempt to create a triple mutant using a single CRISPR-Cas9 construct was unsuccessful as the triple knockout construct would not regenerate plants in the tissue culture. This was a setback; however, it also meant that triple mutant is probably embryo lethal. To work around this, we created another double mutant of BBM2 and BBM3 (bbm2 bbm3), crossed it with bbm1 bbm3 double mutant and selfed the progeny for the next two generation (Fig. 2b). The triple mutant was indeed embryo lethal (Fig. 2b). But instead of observing a typical 25% lethality (expected from Mendelian genetics), because the mother plant was segregating only for BBM1 (BBM1/bbm1 bbm2/bbm2 bbm3/bbm3), there was a 36% lethality. This was found to be linked to the male transmission of BBM1 from the sperm cell (Fig. 1). This proves that a functional copy of BBM1 from the sperm cell is essential for embryo initiation in rice. This is a novel mechanism that explains why the egg cell (at least in rice) depends on sperm cell fertilization to initiate embryo development. Figure 2. Schematic showing constructs for mutants and redundancy in BBM1, BBM2 and BBM3 genes. (a) bbm1 mutant alone, or in combination with bbm3 have no embryo phenotypes. Also, loss-of-function bbm2 bbm3 double mutant shows no aberrant embryonic phenotype. (b) bbm1 bbm3 and bbm2 bbm3 double mutants were crossed to create bbm1 bbm2 bbm3 triple knockout mutant, which was embryo lethal. This work was started purely as a development biology project, but we soon realized this understanding of the basic mechanism of embryo initiation can have agricultural applications. The first application is the conversion of egg cell directly into an embryo without fertilization: it meant we could generate haploid plants. Haploids have only one set of chromosomes, in this case maternal. This makes them efficient agricultural breeding tools as homozygous lines can be produced in one generation after chromosome doubling, bypassing the several generations it takes by inbreeding procedures. The technique we developed does not involve the tedious and laborious tissue culture techniques used in microspore cultures or rescuing and culturing haploid embryos in subsequent generations as seen in wide crossing procedures. The haploids can be grown simply from functional seeds (Fig. 3a). Figure 3. 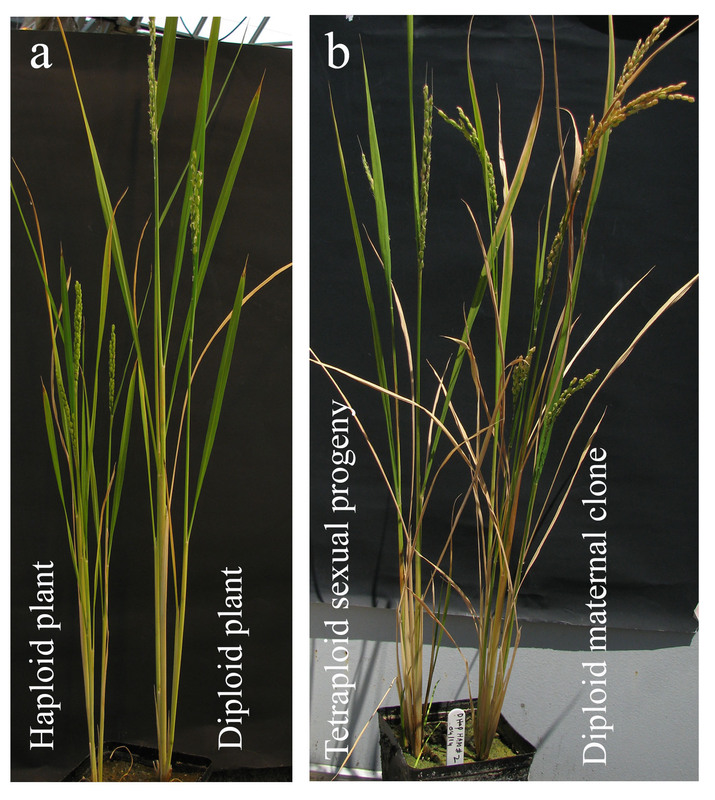 Haploids and synthetic apomicts in rice. (a) Two segregating sibling plants from BBM1 egg cell expressing mother. The haploid plant is a result of parthenogenesis and diploid plant of sexual reproduction. (b) Progenies from a diploid synthetic apomixis mother. Diploid plant develops from the parthenogenesis of diploid egg cell created by MiMe and hence maternal clone. Tetraploid sibling develops sexually from the fusion of diploid gametes. The second application is synthetic apomixis by which an unreduced diploid egg cell is converted into a maternal clone, allowing for the maintenance of hybrid vigor. Hybrid vigor, or heterosis refers to the increase in yield, growth or other quantitative characteristics in F1 hybrids, compared to parental inbred lines. However, the genetic combinations that lead to this vigor in F1 hybrids, segregate in the F2 generation due to sexual reproduction and thus resulting in loss of vigor. For this reason, farmers need to buy hybrid seeds, every sowing season. Therefore, a hybrid crop that could self-reproduce through seeds while maintaining the parental heterozygosity would solve this problem. During sexual reproduction, meiosis results in recombination and segregation of genetic traits, and fertilization creates new genetic combinations. MiMe (mitosis instead meiosis), is a genetic approach that skips meiosis and converts meiotic cell division into a mitotic like division5. This approach was developed by our collaborator, Raphael Mercier’s group at INRA France. We combined MiMe with our BBM1 induced parthenogenesis system. The two approaches together produced progenies which have the same genetic constitution as that of the mother plant. In other words, the progenies are genetic clones of the mother plant (Fig. 3b). The MiMe produces diploid egg cells which parthenogenetically develop into embryos due to BBM1 expression. The clonal nature of progeny and mother plant was confirmed by whole genome sequencing (Dr. Debra Skinner analyzed the sequences). The endosperm that developed was, however, sexual. Since the gametes are diploid, the endosperm in progenies is hexaploid instead of the usual triploid. This 6X endosperm increases the seed size (Fig. 4a). Thus, this synthetic apomixis approach not only results in clonal propagation but also increases the seed size and hence the yield. This mode of apomixis is seen in some naturally apomictic plants like Boechera6 and others. Engineering apomixis in crop plants ensures fixation of hybrid vigor and stabilization of superior heterozygous genotypes. Also, the yield, quality and exchange of vegetatively propagated true seed crops can been improved by introgression of apomixis (hence seed propagation) as the accumulation of somatic mutations, viruses, and other pathogens over successive generations can be avoided. The successful engineering of apomixis in crop plants is a significant step towards achieving the food security for growing world population. Figure 4. Seed size in synthetic apomixis plants. (a) Seeds from different genotypes having different ploidy for embryo (em) and endosperm (en). The seed size increases in synthetic apomictic pants due to increase in endosperm ploidy (6X). 1, wild-type; 2, haploid synthetic apomictic seed; 3, control MiMe; 4, diploid apomictic seed; and 5, tetraploid apomictic seed. (b) Genotyping team at Sundar lab, UC Davis. A major challenge we faced during this study was to be able to genotype the thousands of rice plants used in this study (Fig. 4b). The plants needed to be genotyped for T-DNA insertions, copy number determination and CRISPR-Cas9 mutation analysis (quite often for three genes in the same plant). We highly appreciate the helping hand from Bao Nguyen (now at UC Santa Cruz) and Alina Yalda. Preparing samples for flow cytometry for ploidy determination was another time-consuming procedure. However, the final outcome of being able to decipher the mechanism of sexual reproduction in rice and utilization of this knowledge to make it reproduce asexually, made it all worth the effort! 1 Edgar, L. G., Wolf, N. & Wood, W. B. Early transcription in Caenorhabditis elegans embryos. Development 120, 443-451 (1994). 2 Anderson, S. N. et al. The Zygotic Transition Is Initiated in Unicellular Plant Zygotes with Asymmetric Activation of Parental Genomes. Developmental cell 43, 349-358 e344, doi:10.1016/j.devcel.2017.10.005 (2017). 3 Steffen, J. G., Kang, I. H., Macfarlane, J. & Drews, G. N. Identification of genes expressed in the Arabidopsis female gametophyte. The Plant journal : for cell and molecular biology 51, 281-292, doi:10.1111/j.1365-313X.2007.03137.x (2007). 4 Boutilier, K. et al. Ectopic expression of BABY BOOM triggers a conversion from vegetative to embryonic growth. The Plant cell 14, 1737-1749 (2002). 5 Mieulet, D. et al. Turning rice meiosis into mitosis. Cell research 26, 1242-1254, doi:10.1038/cr.2016.117 (2016). 6 Rojek, J. et al. Establishing the cell biology of apomictic reproduction in diploid Boechera stricta (Brassicaceae). Annals of botany 122, 513-539, doi:10.1093/aob/mcy114 (2018).